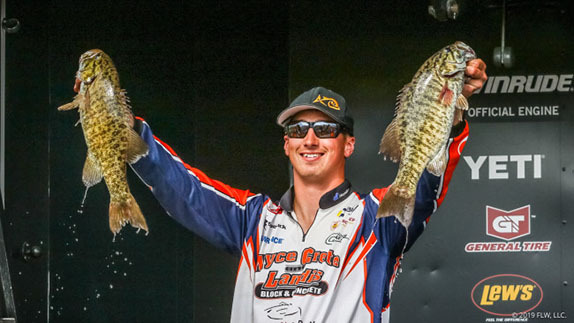 Andrew Upshaw caught 18-06 on a day when everything went right for the Oklahoma angler at the Cherokee Lake FLW Tour. It may not be on the level of a Lake St. Clair (not many lakes are), but Cherokee Lake sure is loaded with smallmouth. And today, it seemed like all of them were biting. 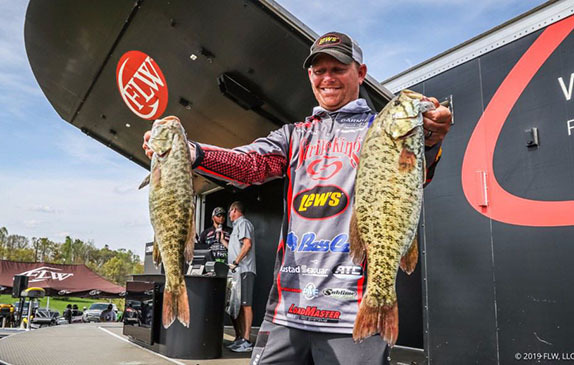 Case in point: Only 21 of the 164 pros (12 percent) didn�t bring in a limit on day 1 of the FLW Tour event on the east Tennessee reservoir. That�s not too far off last year�s Tour event on St. Clair, when only 8 percent failed catch five keepers on the first day. While everyone was catching fish, getting the 3- and 4-pounders were what separated the top anglers from the rest on what is a remarkably tight leaderboard. And of those who did get those bigger bites, no one got more than Andrew Upshaw. The Tulsa, Okla., pro had �one of those days,� and the result was an 18-06 bag, which gives him a 9-ounce cushion over Dylan Hayes in 2nd. After Upshaw and Hayes, the rest of the top 10 is bunched up within a few ounces of the 17-pound mark. Tim Frederick and Austin Felix both brought in 17-04, while Andy Young and Jason Reyes mirrored each other with 17-02 bags. 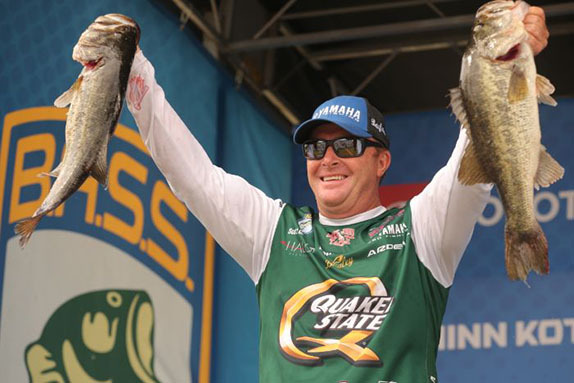 Johnny McCombs seems to be getting back on track, as he�s in 7th with 17-01, and Tom Monsoor found 17 pounds of bass that wanted his swimjig. Ron Nelson (16-12) and Lake Seminole winner Buddy Gross (16-09) round out the top 10. The weights drop off pretty hard after that. As Reyes mentioned, while there are plenty of fish in Cherokee, there are not enough big ones to easily cull up once an angler hits the 12-pound mark. Hence, almost half the field is bunched up between 12 and 15 pounds. That said, when you�re catching 45 bass a day as Reyes did � he figures he threw back a 14-pound limit � or you�re basically done fishing after your first two spots like Upshaw, it certainly gets easier. A known sight-fishing stick, Upshaw had a milk run of bedding smallmouths to go through to first thing. 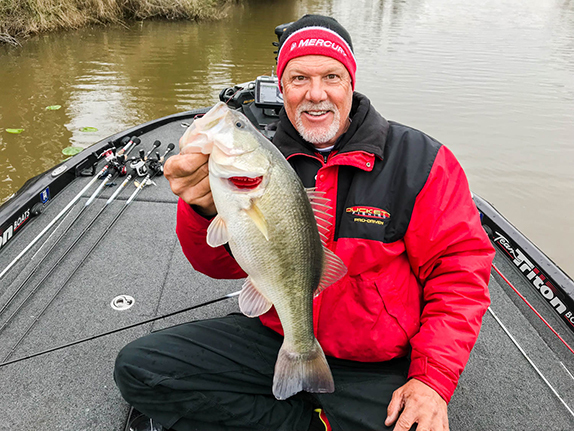 It was so quick, in fact, Upshaw says he only hit 15 percent of his fish he�d found, and he spent the majority of his day going for a truly big bite. He nearly got it, too, when he had a 6-pound largemouth follow in a big glide bait but not bite it. Reyes was also on the bedding-smallmouth bite, though he�s not necessarily looking at them. Of the dozens of fish he caught, Reyes never caught a largemouth. Upshaw was nearly in the same boat, though he actually caught a pair of surprise green fish right off the bat. The same could not be said for Hayes. Because he chose to target largemouth, he admittedly struggled through most of practice. Yet, in the final hour, Hayes says he found a small staging area that had some quality largemouths. Today, that little area produced a quick limit of green fish and it also coughed out a 4-11, a 4-06 and a solid 3-pounder. Once he had his kickers, Hayes went looking for bedding smallmouths to try and cull out the smaller largemouths he had. In the process, he caught a bonus 3-pound largemouth before catching his lone keeper smallmouth off a bed. Big bites may not be the lone problem going forward. While Cherokee showed it has a healthy population of fish, it�s not a St. Clair, in that it seemingly has an endless supply of them. Instead, after such a banner day, Reyes and others are concerned the bite will dwindle or even get tough by the weekend. > Day 1 stats � 164 anglers, 143 limits, 9 fours, 9 threes, 1 two, 1 one, 1 zero.